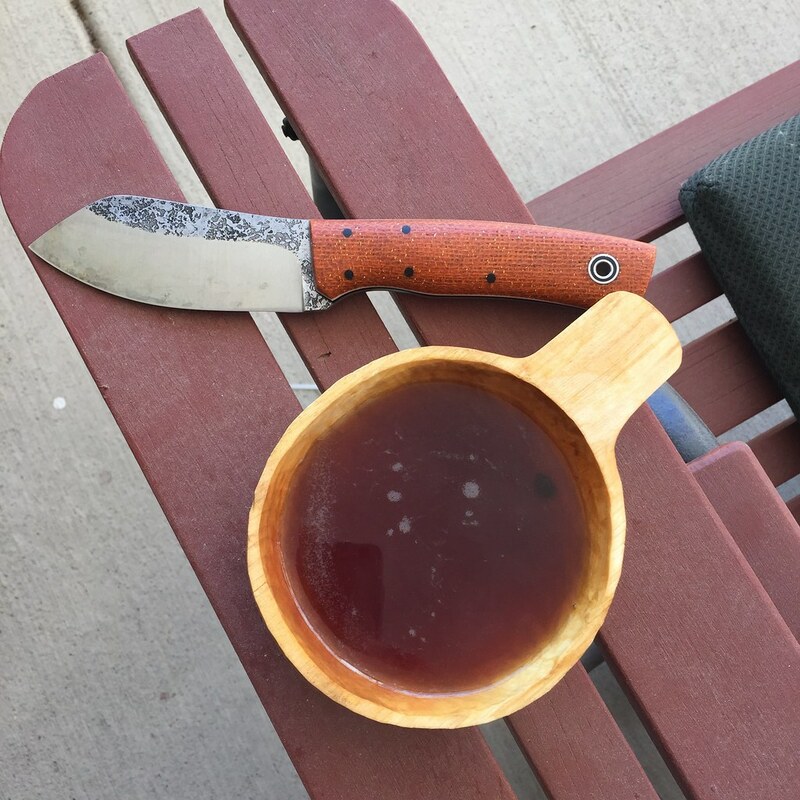 Discussion in 'Fiddleback Forge Knives' started by Southern Gent, Feb 9, 2016. Two of my favorite things, often enjoyed together! Here is a place to share your favorite Fiddlebacks with whatever source of caffeine you need to jumpstart your day. 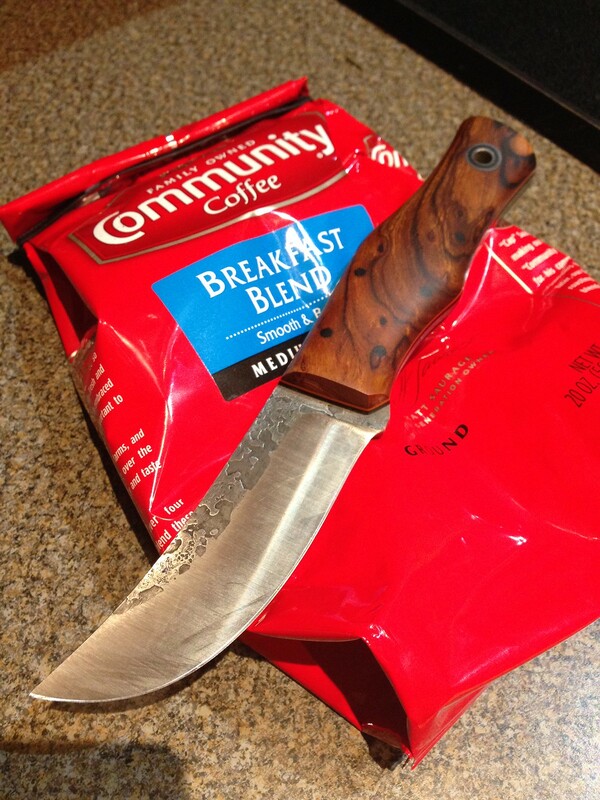 Here are some freshly ground Buckhead Beans with my new favorite Fiddleback. S4audiV8 and kmellino like this. Looking good. Love that KPH. I love the idea of this thread. I can't wait to get home and take pics. 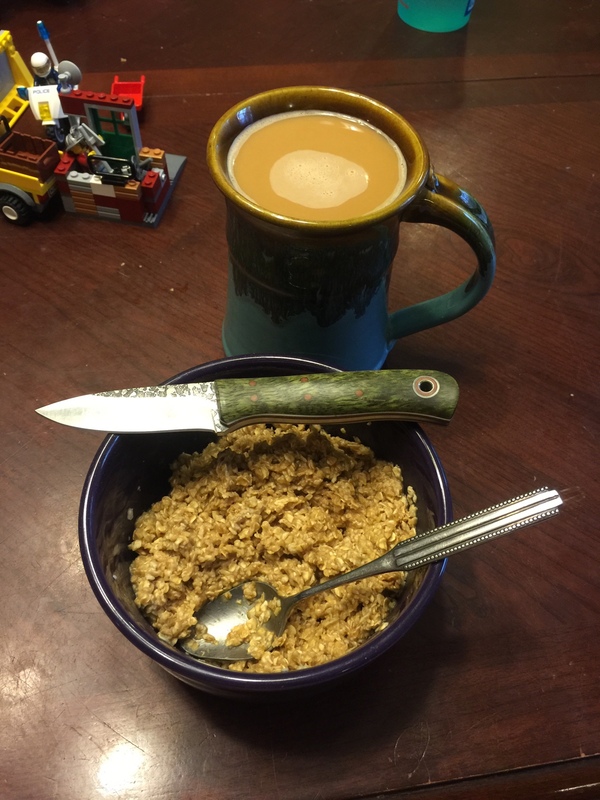 Especially since one of my favorite things to do is get a fire going on the weekends, brew up a pot of coffee, and play with my knives (and other various weaponry). Great idea. Thanks, Southern Gent. And my best regards to Madden! Cool thread! A couple of things a like a lot! 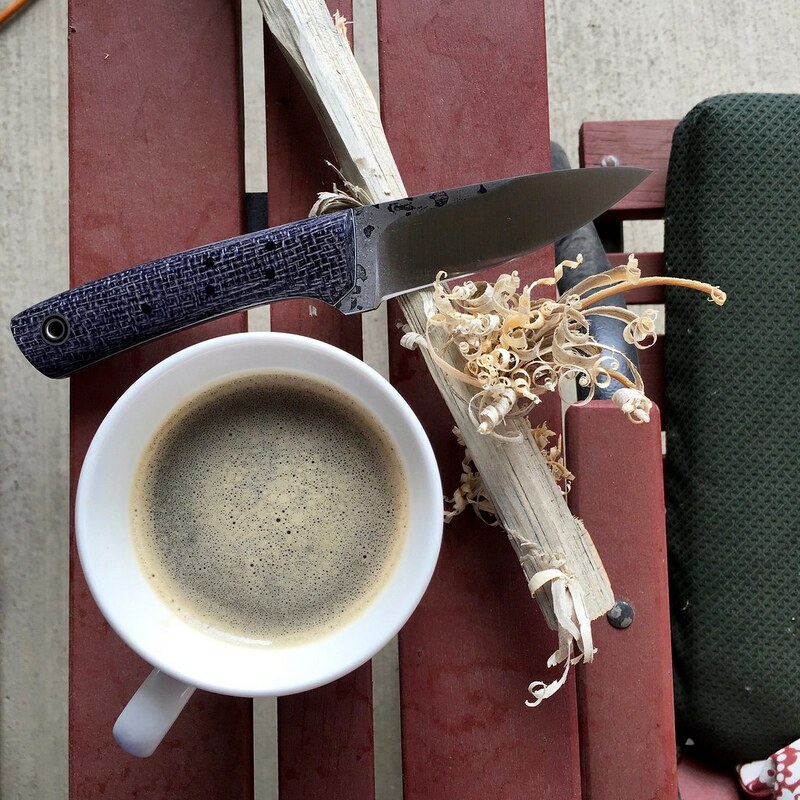 A favorite spot for relaxing - sitting on the front porch in the bench swing with some knives and coffee. Love the knife, thurin. I sure hope Andy will build some more knives with that electric orange burlap. I wish too, but not gonna happen, at least unless Shadetree can find a new source for the burlap. It's all been used up and they can't make anymore currently. I'll have to change my grail specs! 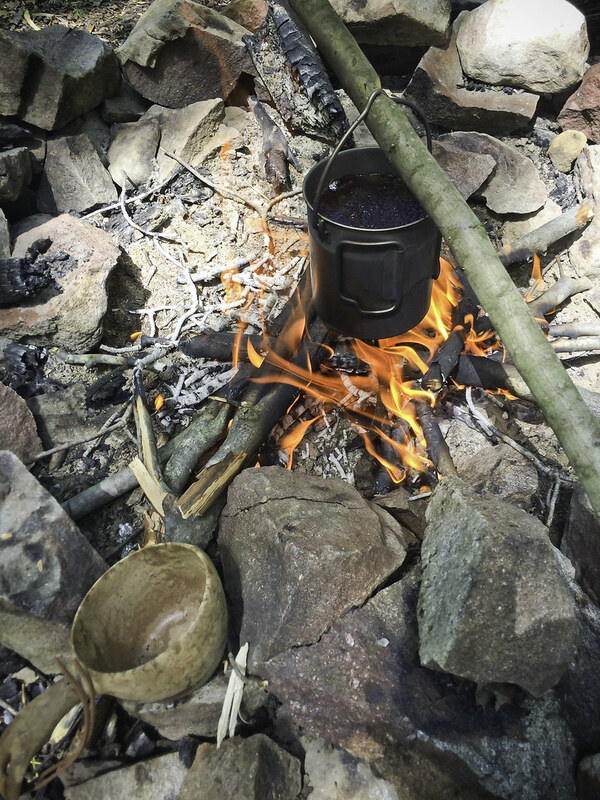 My hiking buddy with some Java and stick to your bones oatmeal! awesome blade! this doesnt look healthy for the tip though..
That knife is very hard to do justice in photos, it is really gorgeous in person. At RC-61 what is going on in the photo in and of itself is not a problem for the knife. The trick is in just not scraping the tip across the rock. Other than that there will be no damage done by just the knife's own weight. Thanks Jim. 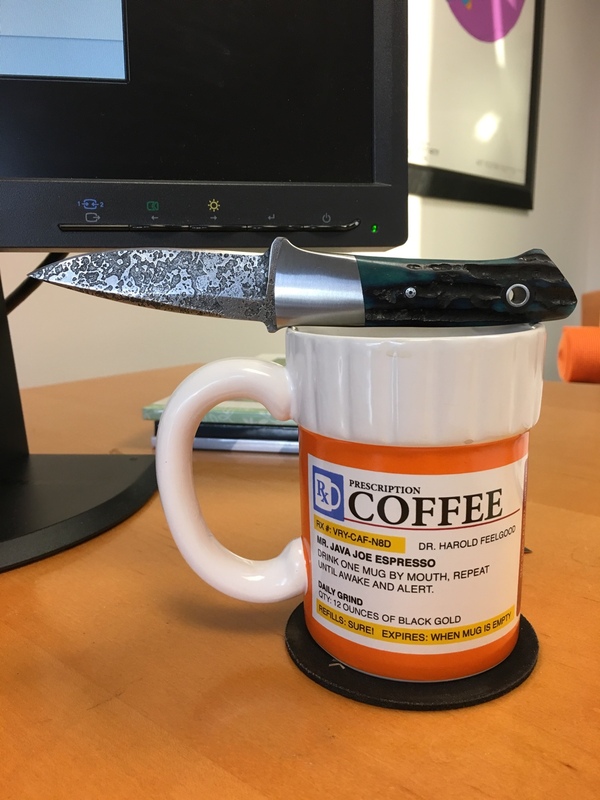 Yea, I drink my coffee pretty dark. I typically grind them fresh right before brewing, and for day trips like this, they're ground in the morning before I leave my house. 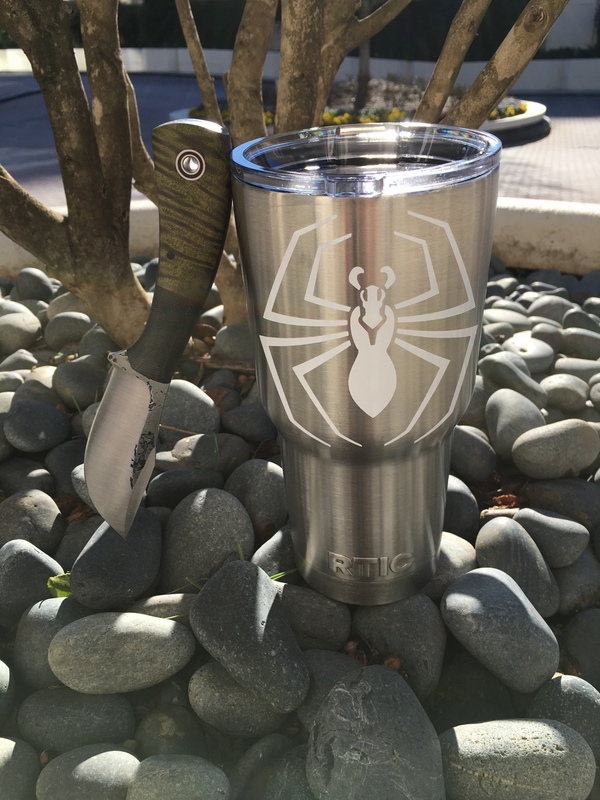 This allows the coffee to be devoid of most of that bitterness you get from pre-ground coffee. Plus, I usually consume beans within two weeks of their roasting as well. 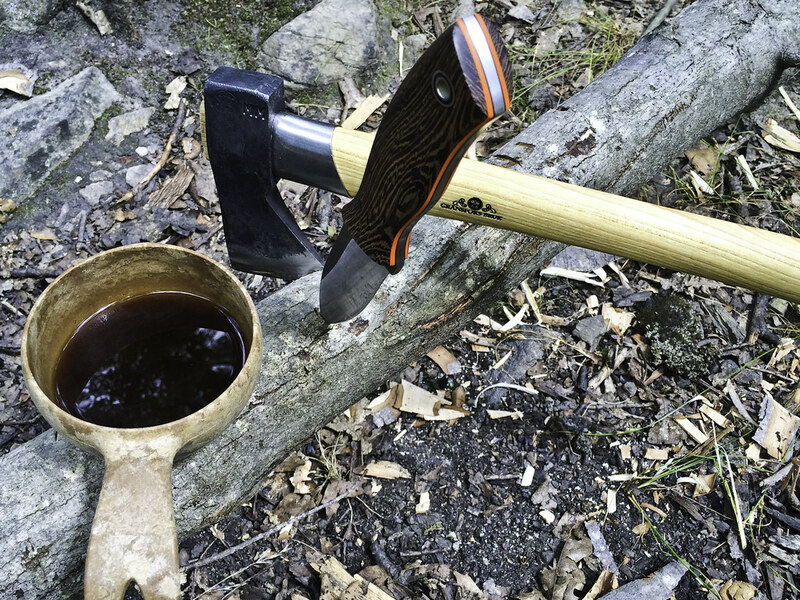 And yes, that's my GB Outdoor axe, I've tried over handful of hatchets (or small axes) from GB and Wetterlings, and the Outdoor Axe has become my favorite for my purposes. Super light, surprisingly a good splitter, and a decent chopper - pretty much a jack of all trade, possibly master of none (well, other than being the master of coolest little axe in my book ). And can't forget about my Sneaky Pete, everytime I cut something with it, it does it with a handshake. Andy will get this... probably grew up on it-- starting with Coffee-milk or maybe Cafe au Lait- but it wasn't breakfast blend back in the day. It was just plain old Community Coffee.